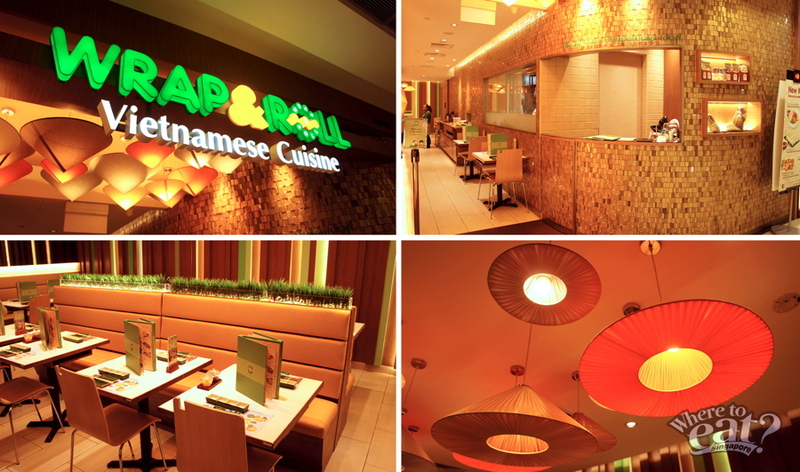 Started in Ho Chi Minh in 2006, Wrap & Roll has since achieved numerous awards like ‘Top 100 Vietnamese Restaurant 2012 in Vietnam’ by Delicious Magazine and ‘Best Vietnamese Restaurant Chain 2010’ by Vietnam Tourism Board. Rewind a few year back, two young Singaporean entrepreneurs discovered new love for Vietnamese food during their holiday in the motherland. It was then that they took to franchise Wrap & Roll in Singapore at The Star Vista and ION Orchard. A relatively new dining concept then, the restaurant was the first to offer freshly steamed Vietnamese rice crepe rolls in Singapore. It mainly focuses on the Vietnamese style of wrapping and rolling with roll-it-yourself dishes, using lots of fresh herbs and vegetables to accentuate the natural tastes of seafoods and meats. Easily recognised as one of the healthiest cuisine in the world. 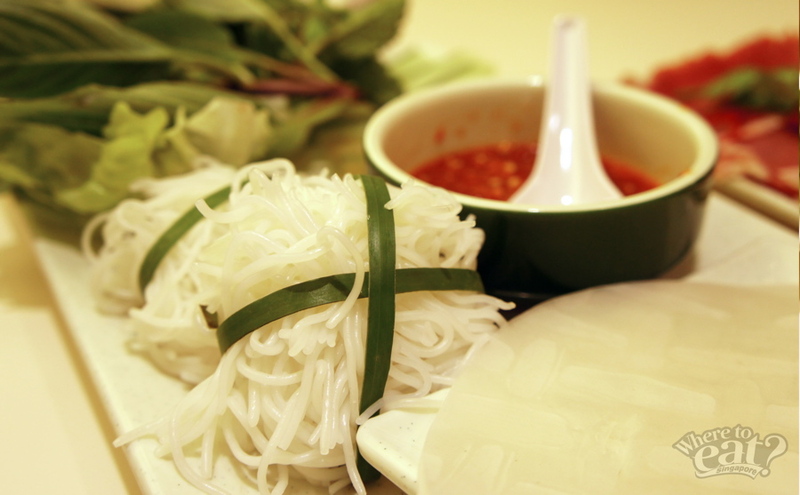 Highly influenced by Chinese and French cultures, Singaporeans should not have a hard time adapting to Vietnamese food. For a start, try the Lotus Shoot Salad with Prawns ($8.90), finely chopped vegetables, crisp crackers, piquant fish sauce and super hot chilli on the side. Bright, tangy and everything nice, the appetiser surely opened up our appetites for what was ahead of us. Still on the appetisers, we had the Taste of Hanoi ($9.90), which is Pho Beef and Minced Pork Steamed Rice Crepe Rolls served with special peanut sauce and fish sauce on the side. Comparing to the local chee cheong fun, Taste of Hanoi has a much thinner rice crepe texture that still manages to hold in the generous tender minced meat and crunchy leafy green ingredients. 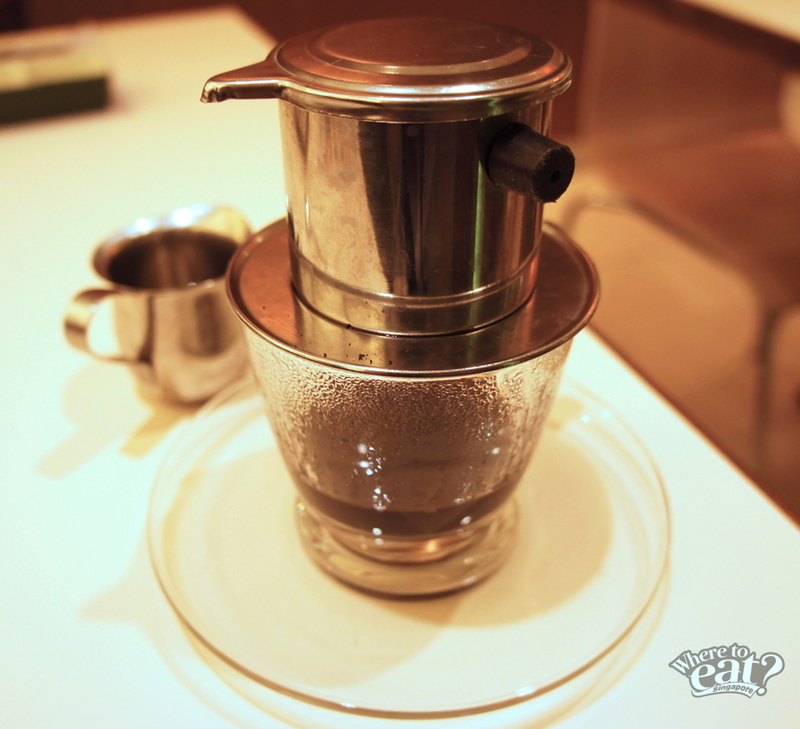 However, unlike Chinese cuisine where sauces are used as condiments, Vietnamese cuisine uses sauces to complete dishes. The fish sauce gave the dish a natural saltiness and light taste that were easily acceptable. 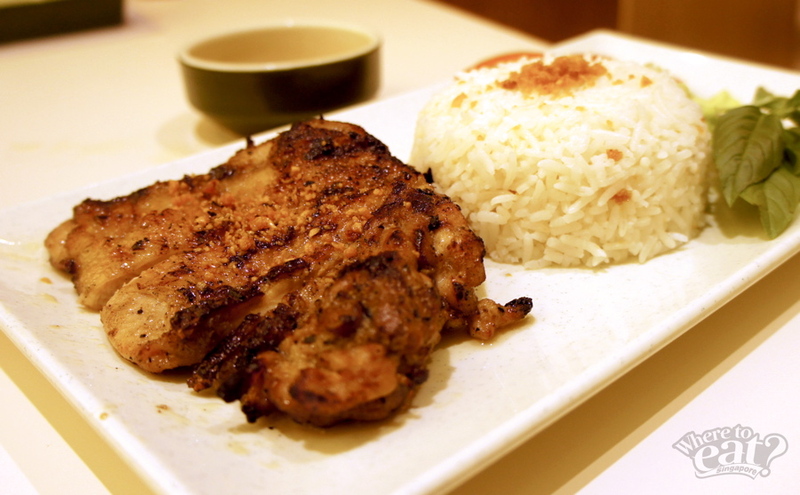 Since rice is a staple food in Vietnamese cuisine, it was no surprise that Grilled Chicken Chop with Rice ($12.90) impressed us. We particularly liked how nicely separated the rice grains were. Even the chicken was perfectly marinated and completely infused with pepper and garlic. The grilled method of cooking gave the dish an earthy aroma and taste. 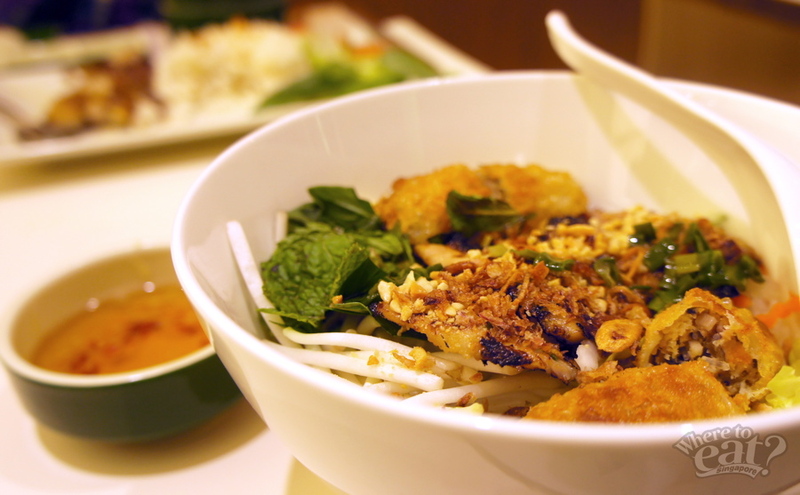 Alternatively, try the Rice Vermicelli with Grilled Pork & Deep Fried Spring Rolls ($12.90). 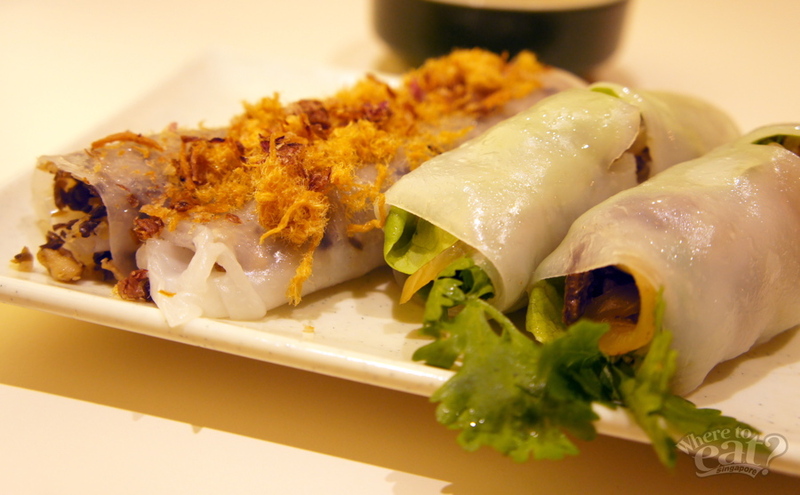 Though deep fried, the spring rolls still left a clean aftertaste – a characteristic of Vietnamese cuisine. Drenched in fish sauce, the noodle which appeared dry was silky smooth instead, blending well with the tenderness of the sliced minced pork. One of the more popular dishes is the Vietnamese Beef Hot Pot ($16.90) served with rice crepe papers, rice vermicelli, mint leaf and more. Originally intended as a Christmas special, the dish was so well received they permanently introduced it into the main menu. Wrapping your own Vietnamese rice crepe roll is actually very simple. 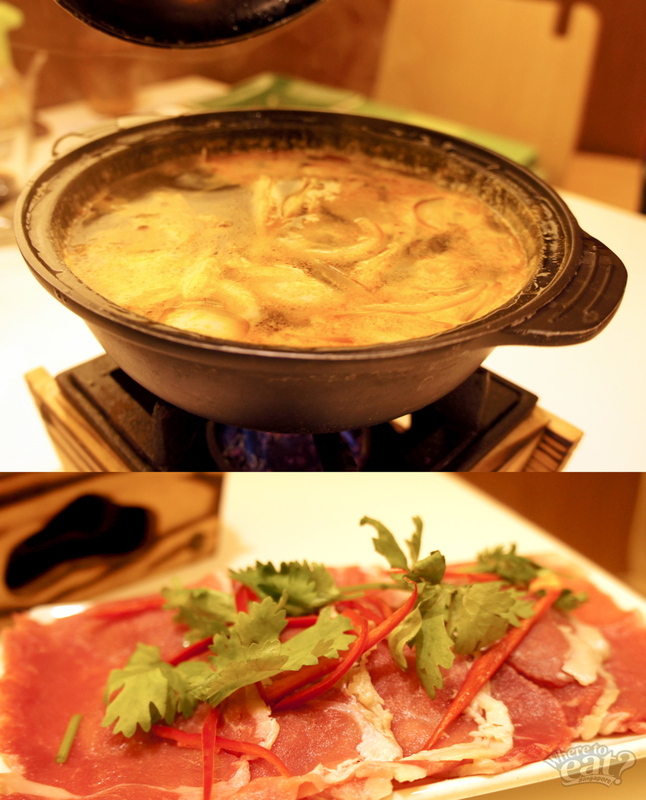 First, place the raw beef in the hot pot to cook. Second, spray your rice crepe paper with water provided to soften. Third, hastily place a portion or piece of each ingredient in the middle of the rice crepe paper while it’s still damp. Lastly, wrap and roll the same way you make popiah. Serious! And if done right (before the rice crepe paper stiffens again) your end produce should hold the ingredients well in place and not be brittle at the edges. Remember to dip with the sauces provided and you are good to go. Similar to the local cendol, Vietnamese Rainbow Dessert ($4.90) boasts colourful ingredients like red ruby; red beans; red bean paste, or tau sar (豆沙) paste; green jelly noodles and fresh coconut milk on crushed ice. You may beg to differ, but we preferred this version to the local one as it was less sweet and less heavy on the stomach. You can have it after your main course without worrying about being too full for dessert. 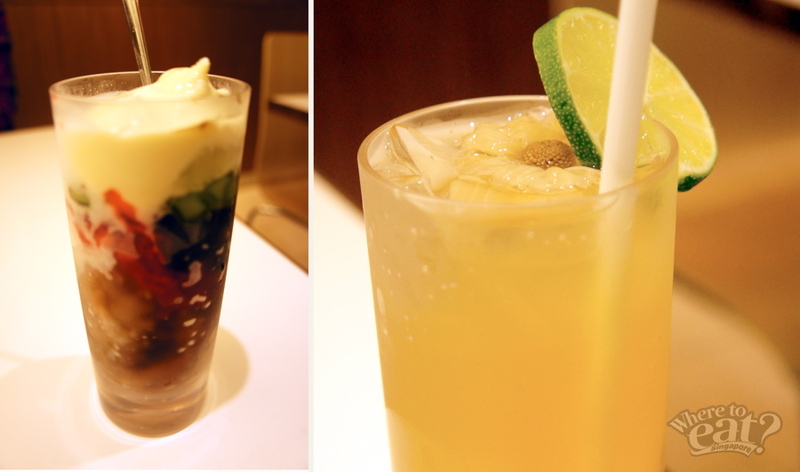 Try drinks like refreshing Vietnamese Iced Chrysanthemum Tea ($3.50) with natural sugar cane juice, and Vietnamese Dripping Coffee (H $4.90/C $5.30) which uses an Asia Pacific blend of coffee. Wrap & Roll makes Vietnamese food fun and easy to eat. Plus the two locations are so easy to reach. 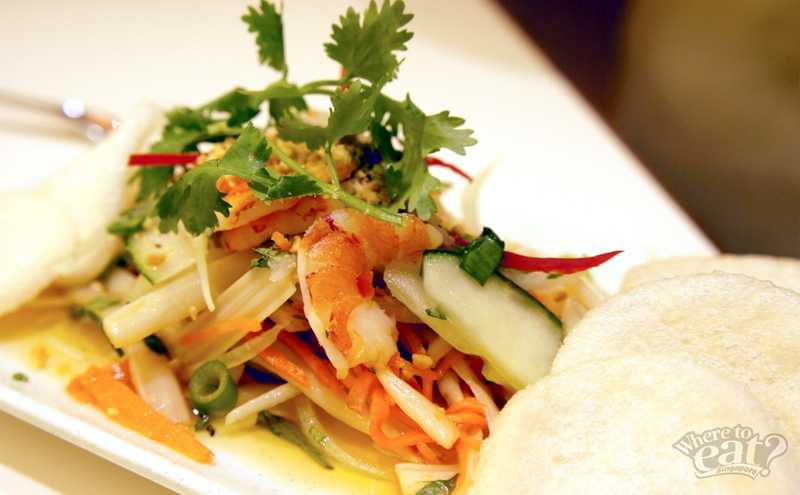 Go with an open mind and you might just find new love in Vietnamese food like we have!